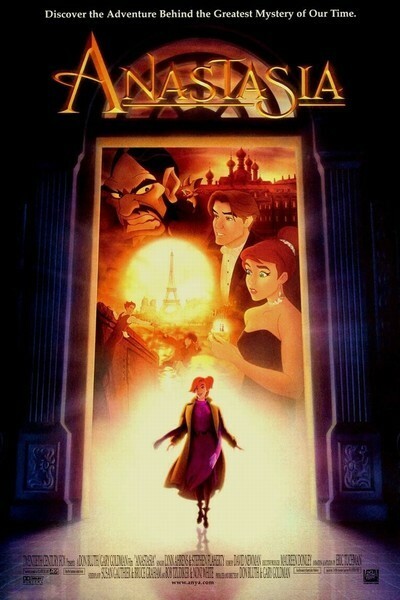 The legend of Anastasia would seem like unlikely inspiration for an animated musical, but “Anastasia” picks and chooses cleverly, skipping blithely past the entire Russian Revolution but lingering on mad monks, green goblins, storms at sea, train wrecks and youthful romance. The result is entertaining and sometimes exciting--a promising launch for Fox's new animation studio, which has declared war on Disney. The movie's based loosely on the same speculative story as the 1956 feature film starring Ingrid Bergman; it assumes that when Russia's ruling Romanov family was murdered in the upheaval of revolution, one child escaped the carnage and survived to make a valid claim for the throne. This was Anastasia (voice by Meg Ryan), granddaughter of the Dowager Empress Marie (Angela Lansbury), who herself escaped to Paris and now wearily rejects one imposter after another. Young Anastasia is seen wrapped in the warm bosom of her family; then disaster strikes, and she spends years in a cruel orphanage, losing all memory of her earlier days. Then as a lithe and spirited teenager, she falls into the clutches of two con men named Dimitri (John Cusack) and Vladimir (Kelsey Grammer). They both worked in the royal court and have insider knowledge; their scheme is to tutor an imposter until she can fool the Dowager Empress. The irony, which the movie makes much of, is that this impostor is, in fact, the real thing. “Anastasia” tells this story within what has become the almost rigid formula of the modern animated feature: The heroine and the hero both have sidekicks, the villain commands nasty little minions, and romance blooms, but doesn't get too soppy. Much depends on how colorful the villain is, and the mad monk Rasputin (Christopher Lloyd) is one of the best cartoon villains in a long time. The real Rasputin became infamous for taking so long to die--he was almost unkillable--and in this movie version he likewise lingers between life and death. His spirit burns on, but his body parts have a disconcerting habit of falling off. His little sidekick Bartok, an albino bat voiced by Hank Azaria, tirelessly screws missing limbs back into place. Anastasia has a friend, too: Her little dog Pooka, who faithfully tags along. Indeed, every important character is assigned a sidekick; Dimitri has Vladimir, and the Dowager Empress has her faithful lady-in-waiting, Sophie (Bernadette Peters). By the movie's end, Dimitri wins Anastasia, Vladimir wins Sophie, and I guess we can be relieved that the filmmakers spared us the Bartok-Pooka nuptials. The film was produced and directed by former Disney artists Don Bluth and Gary Goldman, whose credits include “The Land Before Time” and “An American Tail.” Here they consciously include the three key ingredients in the big Disney hits: action, romance and music. Only the songs disappoint. (Why didn't they do the obvious, and license the title song from the 1956 film?) There are three big action sequences: A storm at sea, as Anastasia sleepwalks perilously close to the briny deep; a runaway locomotive and a wreck, as Rasputin's little green goblins sabotage the train carrying Anastasia to Paris, and a final showdown between Rasputin and the forces of good. The action here is alive and energetic, and the train sequence is genuinely thrilling. What won me over most of all, however, was the quality of the story: It's clearly set up, so that even younger viewers can understand Anastasia's fate and her hopes. (“I'm not exactly Grand Duchess material here,” she says, “a skinny little nobody with no past and no future.”) It gets a couple of neat twists out of the idea of making Anastasia a fraud who isn't a fraud. And the Dowager Empress, as played by Lansbury, creates real pathos with her weariness: How many more frauds must she endure? Animation is the road less traveled for the movies. Although it offers total freedom over the inconveniences of space, time and gravity, it's so tricky and difficult that animated features have always been rare--and Disney has always known how to make them best. With “Anastasia,” there's another team on the field.